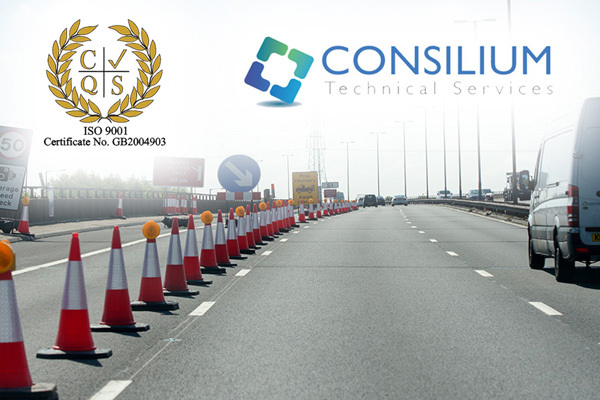 Consilium Technical Services are delighted to announce the upgrade of their ISO 9001 accreditation for the design of temporary traffic management controls to 2015 criteria. First obtained by Consilium in 2014, the ISO 9001 accreditation is a statement of and benchmark for quality assurance, it shows that Consilium has procedures in place that comply with the accreditations extremely high standards. By gaining their re-accreditation, Consilium’s commitment and dedication to world-class service, as well as an ongoing ability to evolve and adapt to any industry changes and standards. For their clients, it showcases Consilium as a quality assured company of the highest standard. “As a company that’s always looking to improve and display our quality to our customers, becoming upgraded to ISO 9001 2015 is massive for us. It gives us that rubber stamp of assured quality and we’re obviously really pleased and proud to be on the receiving end.